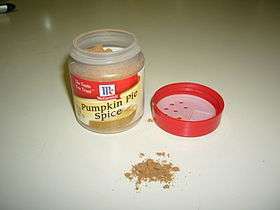 Pumpkin pie spice is an American spice mix commonly used as an ingredient in pumpkin pie, similar to the British and Commonwealth mixed spice. It is generally a blend of powdered cinnamon, nutmeg, ginger, cloves, and sometimes allspice. It can also be used as a seasoning in general cooking.